Apex Legends is now out and while it joins the battle royale genre, the game offers unique features that other battle royale game doesn’t have. One of this feature is the character selection before the match begins. 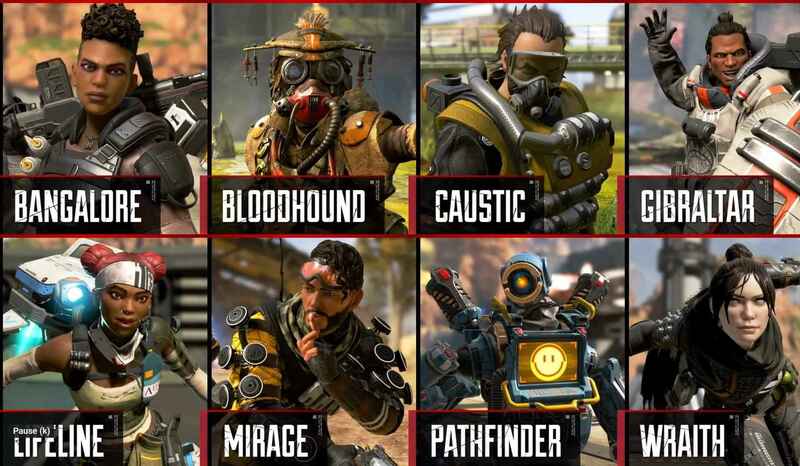 In Apex Legends, players are required to select one of eight characters that they will be using in the game. Each character has their own unique ability that will help their team to take home the trophy. Coordination and strategy are some of the core features that each team should have so before you jump into the game, here are the characters and their abilities that will help your team win. Lifeline is the ultimate support element to the team. She’s not just an ordinary healer, he’s an all in package for a team. Passive: Combat Medic – Revive teammates faster while being protected by her shield. Healing items are 25% faster when used. Tactical: D.O.C. Heal Drone – A support drone that will heal nearby teammates over time. Ultimate: Care Package – An all in package drop pod full of valuable gears. Bangalore is a former military weapon expert equipped with high combat skills and speed. Adding her to a squad will surely boost the chance of winning for a team. Passive Ability: Double Time – Moves faster while taking fire for a short period of time. Ultimate Ability: Rolling Thunder – Call in an artillery strike that will surely leave devastating damage to the enemy. Bloodhound is a mystery but what is known in the world of Apex is that nobody can hide from him once he got your scent. This is another Legend that will surely keep you safe and at the same time surprise your enemy for an attack. Tactical Ability: Eye of the Allfather – Reveal any hidden traps, clues, and hiding enemies. Ultimate Ability: Beast of the Hunt – Enhanced movement speed and real-time enemy tracking. Ohh… A tactical scientist using his knowledge and turning them as a tool to deal with his enemies. Caustic offers toxic weapons that to help your team take out all the enemies. Passive Ability: Nox Vision – Ability to see foes through your own gas. Tactical Ability: Nox Gas Trap – A canister that releases deadly gas when shot or triggered. Ultimate Ability: Nox Gas Grenade – Creates a large deadly Nox gas. This guy is the tank of all the legends. With his amazing list of skills, adding him to the lineup will secure your win. Tactical Ability: Dome of Protection – Deploys a huge area of dome shield to block any incoming attack for 15 seconds. Ultimate Ability: Defensive Bombardment – Calls a mortar strike to a marked area. Mirage is an easy go lucky legends equipped with the most advanced holographic technology. Why not add him to your team and use his technology tricks to give your team a win? Passive Ability: Encore – Drops a decoy and cloak when knocked down. Tactical Ability: Psyche Out – Deploy a holographic decoy to lure enemies. Ultimate Ability: Vanishing Act – Deploy a squad of holographic decoy to trick enemies while cloak is active. Not all of the legends are human. Meet Pathfinder, an advanced robot that offers a huge advantage for a team in terms of mobility and technology. Passive Ability: Insider Knowledge – Ability to reveal the ring’s next location. Tactical Ability: Grappling Hook – Shots a line to grapple hard to reach areas. Ultimate Ability: Zipline Gun – Shots a zip line from the current position to another for everyone to use. Another legend that offers out of this world abilities. She was able to manage dimension rifts that can be used as an advantage to take down enemies. Passive Ability: Voices from the Void – A warning voice when you’re about to face danger. Tactical Ability: Into the Void – Teleport to a place without taking any damage. Ultimate Ability: Dimensional Rift – Opens a two-portal for 1 minute allowing any to travel from one place to another in a split second. And that’s all the characters and their abilities that you can use in the game. Apex Legends is now out on PC, PS4, and Xbox One.